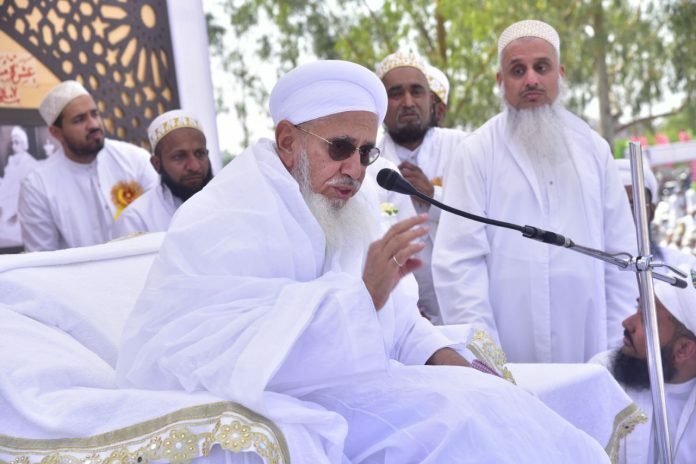 More than 10,000 community members gathered on roads and waited for hours to get a glimpse of Syedna Mufaddal SaifuddinTUS who arrived in the city by road after landing in Indore. He proceeded first to Mazare Najmi – the mausoleum of one of his predecessors as al-da’i al-mutlaq, Syedna Abdulqadir NajmuddinRA. At the airport, he was welcomed by Member of Parliament Chintamani Malviya and other members of the district administration. An example of the city’s religious harmony was seen with the arrival of Syedna on Rang Panchmi. From KD gate, he went to Mazare Najmi in an open Jeep, accompanied by youth on motor cycles, four bands and a marching guard. He will stay in the city until March 12. In these 7 days, he will take part in numerous religious meetings, programmes and a mass marriage programme for the Bohra community. He is also expected to have lunch in the houses of selected community people. Thousands of people from all over the country are expected to come to the city during Syedna’s stay.